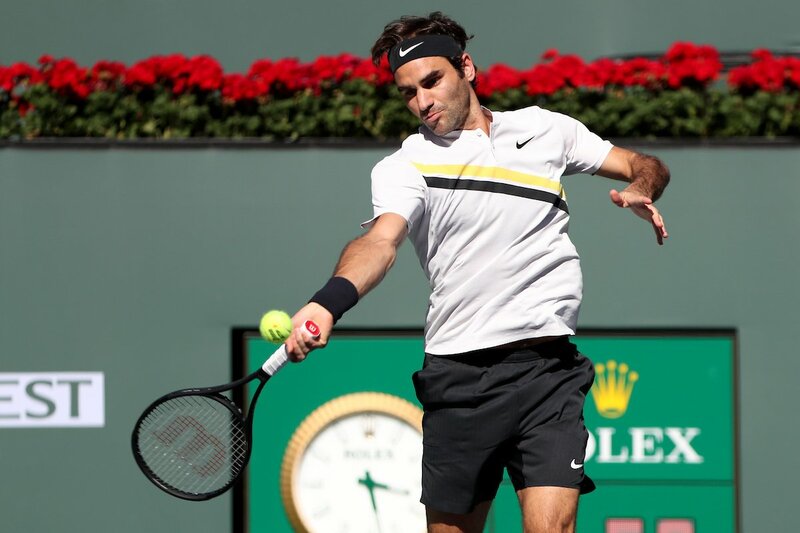 In his first tournament since returning to the top spot of the ATP Rankings, Roger Federer overcame a spirited effort from Argentina's Federico Delbonis to advance to the third round at the BNP Paribas Open on Sunday. Federer prevailed 6-3, 7-6 (6) in a match that was carried over from Saturday evening due to rain. Four games were played in the second set when the skies opened at 10:30 PM local time. Upon resumption on Sunday, Delbonis did well to force a tie-break, but Federer was too strong in the end. He closed out the win after one hour and 41 minutes, saving all three break points faced. It was the Basel native's 450th match at the ATP World Tour Masters 1000 level, improving to 351-99. Making his 17th appearance in Indian Wells, he kicked off his bid for a sixth tournament title. "It is interesting, when you go from night to day and you know there is a difference," said Federer. "So naturally it's all a change. Here now you play the same guy the next day, so you can really compare how different conditions are. It was actually quite interesting. "They play very different. In the nighttime, the ball is much more deader. The surface doesn't react so much. The ball doesn't travel so fast. Even though I served my five aces yesterday, I hit none today. So talking about faster, I just think there is more bounce to it, especially if you play someone who has a lot of spin like he has and kicks the ball around a lot. It's been a long time since I have been interrupted at night and have to come back the next day." Delbonis entered the encounter with hopes of springing the upset, having claimed their lone previous encounter in Hamburg in 2013, but that was quickly quashed by the top seed. Federer, who returned to World No. 1 at the ATP World Tour 500 event in Rotterdam last month, is assured of remaining at the pinnacle of the ATP Rankings should he reach the semi-finals in Indian Wells. Federer remains ruthless in 2018, extending his win streak to 13 straight since the start of the season. Champion at the Australian Open and ABN AMRO World Tennis Tournament, he has dropped only three sets from 35 played this year. Still looking to adjust to the high-bouncing conditions in the desert, Federer will look to improve on his 40 unforced errors when he faces 25th-seed Filip Krajinovic in the third round. It will be their first meeting. Krajinovic, who reached the final at the Rolex Paris Masters last year, defeated American qualifier Mitchell Krueger 6-2, 6-2 on Saturday.